Niger: Moussa Kaka Taken to Niamey Prison Without Explanation Reporters sans Frontières (Paris) PRESS RELEASE 25 September 2007 Reporters Without Borders today condemned the transfer of radio station head Moussa Kaka to Niamey prison after a prolonged period in custody without being taken before the prosecutor or being given any explanation, as demanded under law. Kaka, of privately-owned Radio Saraouniya, and correspondent in Niger for Radio France Internationale (RFI) and Reporters Without Borders, was moved to prison on 24 September, four days after his arrest. "It is astonishingly lax to arrest one of the country's most prominent journalists without producing any serious proof and flouting the law. In such a serious case, it is beyond belief that the Nigerian authorities should show such contempt. It gives legitimate reason to question the credibility of the procedure which led to Moussa Kama being sent to prison," the worldwide press freedom organisation said. The journalist was held in custody for a four-day period which expired at 6pm on 24 September without ever being formally charged. 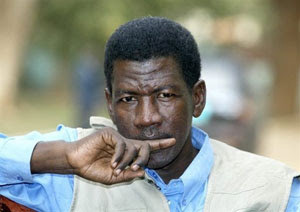 The only indication of what the journalist is accused of came from the prosecutor general of the Niamey appeal court, Adama Harouna, who said on 21 September that he faced proceedings for "violating state security", because of his alleged links with the Tuareg rebellion of the Niger Movement for Justice (MNJ). His lawyer, Mr Coulibaly said that he should be taken before the prosecutor's office during 25 September. In a statement released yesterday, RFI voiced its "very serious concern about the fate of our correspondent". "In the absence of precise facts setting out the details of the accusations against our correspondent, RFI questions the exact reasons which led the authorities in Niger to arrest and then imprison a journalist, well known for his professionalism and independence," it said. Reporters Without Borders defends imprisoned journalists and press freedom throughout the world. It has nine national sections (Austria, Belgium, Canada, France, Germany, Italy, Spain, Sweden and Switzerland). It has representatives in Bangkok, London, New York, Tokyo and Washington. And it has more than 120 correspondents worldwide. RELEASE!! Niger journalists free - for now Niamey - Police in Niger have released two journalists held for allegedly defaming the country's finance minister but they still face prosecution, a press association said on Friday. "They have been freed but the prosecutor has notified them that legal procedures will follow their normal course," Boubacar Diallo of the Association of Independent Press Editors told AFP. Soumana Maiga, founder of the biweekly L'Enqueteur, was detained Wednesday, while Ibrahim Souley, the publication's director, was briefly detained last Thursday before being held again for questioning five days later. L'Enqueteur published a series of articles last month that included allegations that Finance Minister Ali Lamine Zeine had been involved in embezzlement and favouritism in ministry appointments. Two other journalists are also being held in Niger. Moussa Kaka, Radio France Internationale's correspondent in the country, has been detained since September 26, while Ibrahim Manzo Diallo, director of the biweekly Air-Info, has been held since October 9. 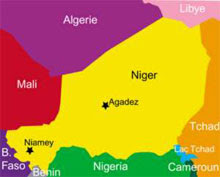 They face charges over alleged links to a Tuareg rebel group active in the country's north. Prosecutors at Agadez, in the north of the country, questioned Manzo Diallo for the first time on Friday, grilling him for three hours in the presence of his lawyer Moussa Coulibaly, who also represents Kaka.